Do you like to color, read, think, and pray? This is the book you've been looking for! You will get to know a beautiful book by Ellen G. White called Steps to Christ, but with a small amount of text to read and written in words you can understand! In this book you will find: -drawings to color, -moments to meditate, -questions for thinking, -and a short prayer. 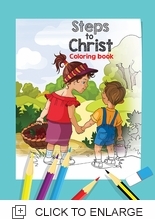 Do you like to color, read, think, and pray? This is the book you've been looking for! You will get to know a beautiful book by Ellen G. White called Steps to Christ, but with a small amount of text to read and written in words you can understand!